WHEN I hear the tunes of Desh Raga, it reminds me of the beautiful sound of rain. It amazes me how Indian Ragas have strings attached with every season, every time of the day and every mood you can think of. And what's more spectacular is the way it is designed to go with a particular instrument that accompanies the raga giving it a whole new dimension. One of such instruments is the Esraj. This 200 year old string instrument was mainly used for instance for accompanying Tagore songs in Bengal. The instrument's six playing strings and 15 resonance strings is equipped with frets as they are found in a similar shape on the Sitar. The sturdy, solid wooden body is covered with goat leather, like the Sarod, which serves as resonance cover. 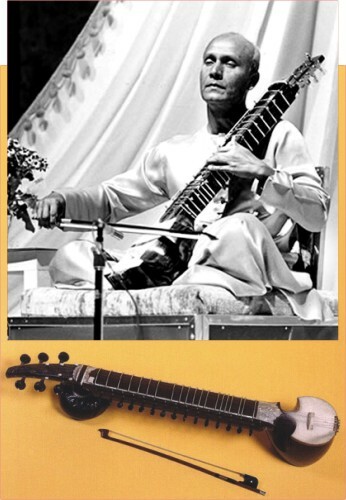 The base of the instrument is like saringda while the neck and strings are like sitar. It gives a sound very much like sarangi without being as difficult to play. The Esraj is played with a bow similar to the violin and produces a sound that is rich in overtones and resonance and which reminds of old Renaissance instruments from Europe. The instrument can be rested between the knees while the player kneels, or more commonly rested on the knee of the player while sitting, with the neck leaning on the left shoulder. “When you play esraj you are not supposed to actually use the frets on the finger board. The frets are simply to let you know where the notes are located. It is a rather squeaky instrument” as quoted by notable Esraj players. The traditional bows for this instrument is much heavier than violins or cellos. The Esraj is translated as the “Robber of the heart”. The popularity of the esraj has been steadily declining. But A R Rahman's brilliant compositions used the Esraj in works like "Dil Se" and "Vande Mataram". Possibly the most famous exponent of the Esraj has been Pandit Ranadhir Ray, who died in 1988. Raga Desh, Ahir Bhairav, Rageshree and many more, breathes through the Esraj.